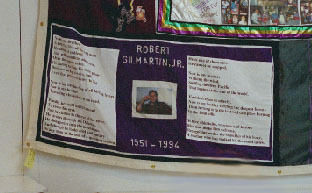 In San Francisco in 1997 I visited the Names Project, home of the AIDS Memorial Quilt which by then had over 32,000 panels. Each panel commemorates someone lost to the epidemic and is made by their partner, friends or family. I copied down this poem from one of the panels. Even that grew too heavy to hold. Now is my brother free of all binding fevers. Travelling where there is no road. He disappears into the mountains. That begins at the end of the world. A brother who has walked his thousand miles.